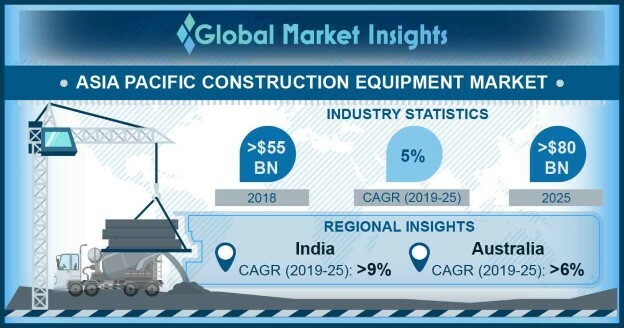 Technological advancements, such as integration of intelligent machine parts, enhanced ropes, and automated machine functions, are also adding up to the Asia Pacific construction equipment market growth. Due to increasing human labor and aging workers in Asian countries, the end-users are moving toward enhanced machinery with technically-advanced features. Moreover, due to various accidents and labor safety issues in conventional methods, the construction industry is witnessing a shift to modern machinery, further supporting the expansion of the APAC construction equipment market. Countries including China, Japan, and South Korea are experiencing a rapid rise in machinery production & consumption owing to the presence of several key manufacturers that supply products across the globe. The companies are investing in product development and global expansion, supporting the market growth. Demand for new machines in the Asia Pacific construction equipment market is rapidly rising due to several infrastructure and building enhancement projects undertaken by various governments such as China, India, and Japan. The presence of several major global manufacturers in China and Japan is aiding customers to purchase technically-equipped products at lower prices and less time compared to other countries, increasing the demand for new machinery. Owing to the presence of several manufacturing plants and distribution facilities, the regional customers can easily avail repair & maintenance services provided by manufacturers, further supporting the growing consumption of new products in the APAC construction equipment market. Online sales channels in the APAC construction equipment market were valued at over USD 1.3 billion in 2018. These sales channels are gaining high popularity due to increased internet usage and timely & high-quality machine provision through manufacturers’ online websites. Due to the convenience of transportation and digital payments, customers are shifting toward online purchasing options, which provide them timely delivery. Online sales channels are growing steadily in the ASEAN countries due to improved mobile connectivity and digitization trend. Additionally, rental companies also provide construction & material handling machinery at low costs compared to the new machinery, further supporting the APAC construction equipment market growth. Customers with low initial investment capabilities switch to the machinery rental options to save the operational & maintenance costs required in buying new machinery. In the Asia Pacific construction equipment market, Australia is expected to grow at over 6% CAGR from 2019 to 2025 due to several renovation plans in Australia’s building & infrastructure sector. Due to the rapidly-increasing Australian population, the government is planning several projects, such as airports, railways, housing construction, and renewable energy, which is expected to create a high machinery demand. The rising emergence of online retail facilities and the provision of replacement parts by the companies through online channels across the globe are also creating opportunities for the industry development. Moreover, several Hong Kong government programs and plans, such as Climate Action Plan 2030, Long-Term Housing Strategy (LTHS), Hospital Development Program, and Railway Development Strategy (RDS), are responsible for the consumption of such machinery in the market.